Clever accessories help improve performance, as well as safety and comfort. This year we present the new easy-to-navigate 2.5" display and the ingenious 7" full color display that you can easily tailor to your specific needs. The 7" full color display shows all available information, the way you want it. Digital or analogue readers, your tailored view or standard view, etc. 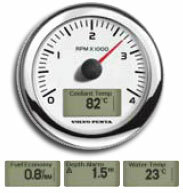 Active software functions, such as Low-speed mode, is displayed. There is also a video input for an onboard camera. Operation is intuitive thanks to the easy-to-understand menus. Easy to-navigate menu leads you quickly to the information that you want. 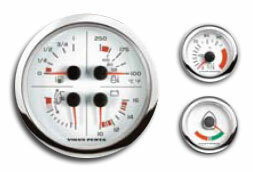 The fuel economy view gives you detailed information on your boat's current and average fuel economy. With a camera connected, you can monitor the engine room or get better stern visibility for increased safety. 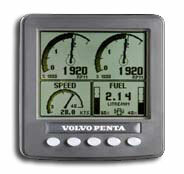 2.5" display for Volvo Penta gasoline engines. Easy to navigate with backlit push-buttons. Can show data from two engines at the same time. Five push-buttons make it easy to navigate. Built to the highest marine standards with anti-fogging membrane and full backlighting. Thanks to the EVC, installation with serial connections is easy. (85 mm and 110 mm). 85 mm and 110 mm). Fuel level, coolant temperature, voltage and oil pressure for inboard, or trim position for Aquamatic (110 mm). Coolant temperature; trim position, analogue reading; trim position, digital reading; fuel tank level; rudder position; water tank level; turbo pressure; battery voltage; engine oil pressure. Lets you control the lighting of all instruments, regardless of make. 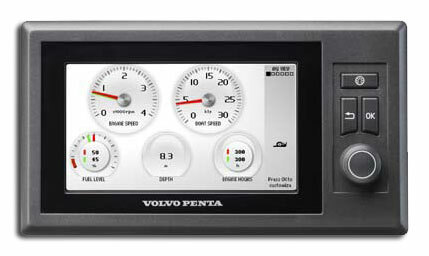 Easy to navigate the LCD window with the turning knob on the EVC main panel.